The Vermilion power plant seen from the Middle Fork of the Vermilion River. VERMILION RIVER MIDDLE FORK, ILLINOIS — As a persistent rain pelts the clear, swift Middle Fork of the Vermilion River on a mid-September day, the water swells and rises. Clumps of tree roots hang precariously over the river, exposed by the crumbly, receding banks. Where the bank is firmer, the water has carved out tiny caves. This is Illinois’s only river to win the federal “Wild and Scenic” designation, and the way the water shapes and gouges the banks is exactly what wild rivers do, changing course and choosing different paths. But this natural process could create a big problem on the Middle Fork of the Vermilion, because the flood plain that was historically the river’s playground contains 3.3 million cubic yards of toxic coal ash, stored in pits near a Dynegy coal-fired power plant that closed in 2011. That proximity creates a potential risk that currently does not appear to be addressed by federal or state regulation. Advocates are worried that erosion from the river could eventually collapse or puncture the man-made impoundments containing the coal ash, spilling it into a river that is a popular destination for tubing, paddling and fishing and runs through the nearby town of Danville, where a riverfront revitalization is underway. The ash pits are adjacent to the Kickapoo State Recreation area, where campgrounds and trails were built on the site of a turn-of-the-century coal strip mine. The park’s website touts the “crystal clear ponds” where water filled pits from strip mining and the “luxuriantly forested ridges and hillsides” that are a testament to “the regenerative powers of nature” on 1,290 acres of mined lands purchased in 1939 from United Electric Coal Company. Studies have shown the river hosts 57 types of fish, 45 types of mammals and 190 types of birds, with 24 of the species listed as threatened or endangered. Advocates feel all this could be at risk if action is not taken to deal with the coal ash pits. But this issue seems to fall into a regulatory gray area. The coal ash impoundments currently meet state requirements for stability. Federal rules on coal ash storage do not apply to the site. And in general, regulations are unlikely to address future risk from the movement of the river. So it will take public pressure and political will to drive proactive measures, as advocates see it. In October, Dynegy is scheduled to begin constructing 485 feet of new reinforcements to a severely-eroding part of the riverbank outside its ash pits. Advocates see this as a necessary emergency step. But they feel like it only delays inevitable continued erosion, and they are demanding long-term protections – moving the ash to new, lined pits that could be built on Dynegy’s property farther from the river. Dynegy acquired the Vermilion coal-fired plant in 2000 with its purchase of the Illinois Power Company. Since its launch in the 1950s, the plant has stored coal ash onsite. In 2011 the plant closed, a victim of competition from cheaper natural gas-fired power and other factors driving the closing of coal plants nationwide. Advocates are worried that if Dynegy isn’t forced to make major overhauls at the site in the near-term, it will end up completing its closure responsibilities, selling the land or deeding it to the state, and taxpayers will be on the hook for any future problems. 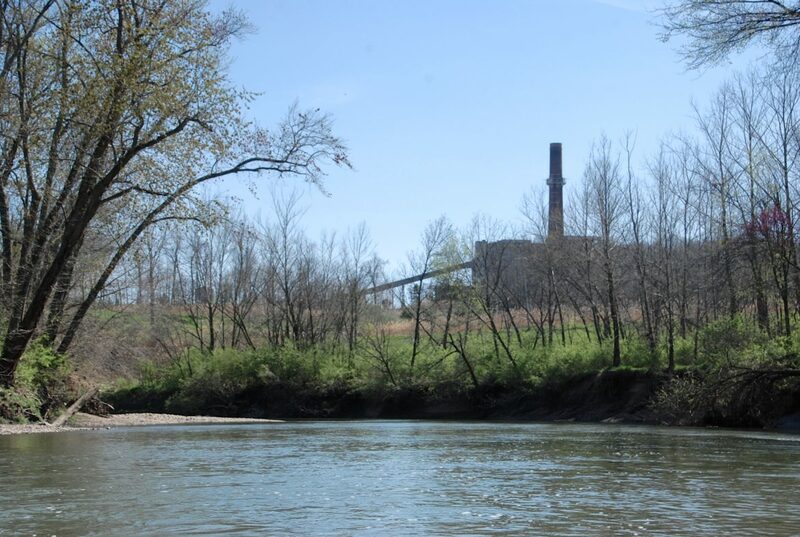 Dynegy has submitted a proposed Corrective Action Plan resulting from a notice of violation it received from the Illinois EPA in 2012 for polluting groundwater with metals from the coal ash. The plan includes installing caps on the ash pits to prevent rainwater from infiltrating and pushing contaminants down into the groundwater. Advocates lament the slow process, and also that the corrective action deals only with groundwater, and doesn’t directly address the future stability of the impoundments. They also posit that caps will do nothing to stop groundwater running through the ash pits from the higher natural slopes on the opposite side of the impoundments. And they worry the weight of a cap could even make the impoundments more vulnerable to collapse in the future. The fact that parts of the ash pits are built over former underground mine shafts are also a concern. Onufer said that there are no wells drawing on groundwater for drinking water within nearly half a mile of the pits, and he said that no adverse effects on the river have been found. Last year federal rules were adopted – after a long, contentious process – governing the storage of coal ash. But those rules do not apply to closed plants. Illinois is in the process of adopting state rules on coal ash that essentially mirror the federal rules. Advocates are pushing for the state to include a provision covering closed coal plants. But even if the state adopts rules applying the federal provisions to closed coal plants, it would not necessarily address the concerns about the river threatening the impoundments at Vermilion. The Old East ash pit on the Vermilion site is unlined and took ash from the 1950s to 1970s. It covers 19.3 acres and is 55 feet deep. The North Pit is also unlined and accepted ash from the 1970s to 1988. An adjacent Northeast pit was constructed in 1988 with a liner, and operated until the plant closed in 2011. In 2005 a pit known as New East was built near the Old East pit. The banks closest to it have shown considerable erosion. Dynegy has sought approval from various state and federal agencies to undertake riverbank stabilization near this pit. Extra approvals for such work are needed given the river’s “wild and scenic” designation. After much back and forth with agencies, Dynegy gained needed approval from the Army Corps of Engineers for the stabilization work set to start in October. The Eco-Justice Collaborative says that about 600 feet are in need of immediate stabilization, and they think Dynegy requested approval for less than 500 feet of work to avoid more stringent requirements that kick in at that distance. The plan, therefore, could leave more than 100 feet of unstable bank exposed. A consultant hired by Dynegy to do a geotechnical report determined in 2013 that the coal ash pits are 35 feet away from the banks of the river. The company URS estimated that the Old East and North impoundments will be at risk of failure when the river is eight and 10 feet from the toe of the impoundments, respectively. It estimates that this will happen in 100 and 80 years, respectively. URS estimated that the bank is eroding at an average rate of 0.3-0.4 feet per year. Rehn argues that an average annual rate is not an appropriate measure for erosion, since one big storm could mean multiple feet of erosion. And if the river changes course significantly, for example cutting a new channel or “short cut,” the intensity of flow can change dramatically. Extreme winter storms in 2015 caused significant erosion. And the National Park Service reported that 20 feet of streambank was lost to erosion between 2009 and the present. Meanwhile intense rainfalls are only expected to increase with climate change. URS explored several options for mitigating the risk of erosion. It says the ash could be moved farther away from the river; that the ash impoundment walls could be fortified or flattened to reduce risk of failure; that cement could be mixed with the ash to stabilize it; that a new channel could be created for the river; or that the river could be contained through the use of gabion walls – essentially wire cages filled with rocks. URS notes that gabions were installed by the Old East pit around 1980. There has been basically no erosion since then on that stretch of river, their report says. However, in multiple spots along the Vermilion the cages are partially empty, as the river has mangled and twisted the wires and allowed rocks to tumble out. The fabric that once covered the cages hangs in shreds, coated with mud and algae. While the gabions apparently have held off erosion for years in some spots, the Richarts and Rehn point to the deteriorating condition of gabions to say that option is bound to be a losing battle.